Larb in Thai cuisine is a type of meat salad that is usually made out of chicken, duck, turkey or sometimes non poultry meat mixed with ground toasted rice then dressed with fish sauce, lime juice and herbs / spices (such as mint, coriander, spring onions and chillies). Usually cooked but sometime eaten raw like the fish versions and even beef that is served together with its blood and bile. But for this post we won’t go that far but instead do the most common one which is the Chicken version. I first saw this dish not in Thailand but surprisingly here in New Zealand on a TV Show which is called MasterChef. It was presented by Bret McGreggor during the top 24 elimination round which is the first stage of the show. Bret McGreggor was the winner of the first New Zealand MasterChef and this dish earned him the 24th spot. Since then I was intrigued by the taste and tried my own version and here it is. 1. In a wok add oil then sauté garlic and ginger, and then add the chicken and cayenne pepper and stir fry until cooked. Set aside. 2. 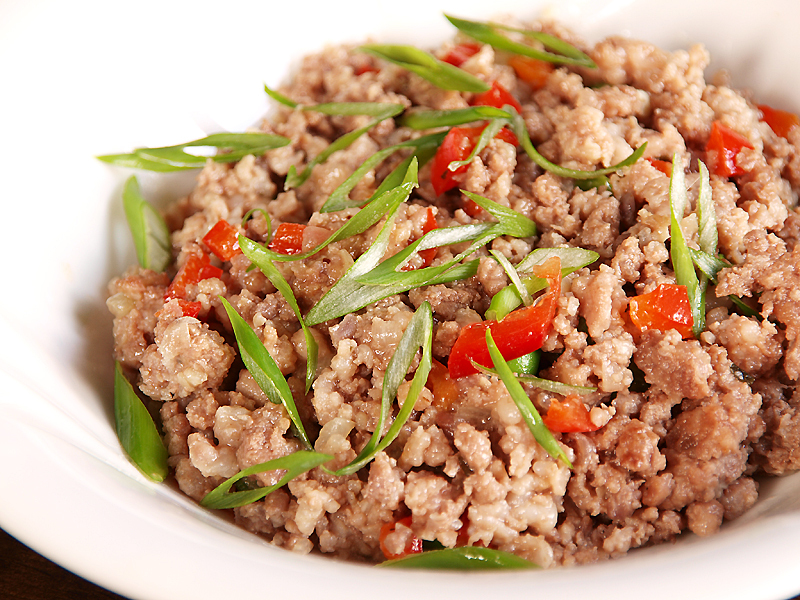 Once cool toss together cooked minced chicken, roasted rice, coriander, spring onions, white onion and capsicum. 3. Combine fish sauce, lime juice and red sugar in a small container then use it to dress the meat salad. I have never heard of Larb Gai before. It sounds very interesting and I am pleased does not include the blood and bile version. This looks great… love the ginger, coriander, mint combination, it sounds very interesting and I’ve never had any decent quantity oh mint and coriander together! Another recipe I’m saving, Thanks! Blood and Bile…not very appetizing lol. But your recipe sounds wonderful! I made this last week and love how flavorful it is for how quickly it comes together.